We only took the test once–in 11th grade, as part of the National Merit Scholarship competition. We took it on Saturday. There was no direct preparation in school. Today, high schools often offer the test for 9th, 10th, and 11th grade students. Freshmen and sophomores take the PSAT to help them prepare for their junior year attempt, which is still the score that counts for National Merit consideration. In many cases, high schools actually pay for all of their students in certain grades to take the test, and it has become common to offer the test during weekday school hours and to align some instruction with the form and content of the test. Like any standardized test, the PSAT has its own ‘scaled’ scores. 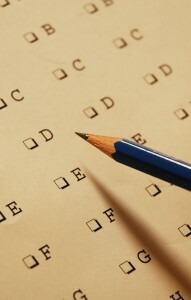 These scores offer predictions of the student’s performance on the SAT. But I encourage students to focus on percentile scores to evaluate their strengths and areas for growth. Percentiles are much easier for most students to visualize, and they simplify comparisons between completely different types of test. Junior Moments. Our 16 year old daughter took the test in 10th grade and again this year as a junior–her school does not offer a 9th grade administration. I learned long ago that when she sinks her teeth into a project my best option may be to stay out of her way. So over the last 2 summers she has spent time working through an old PSAT prep book from my classroom teaching days–her choice, because she wanted to take her absolute best shot at her 11th grade PSAT. In another couple of weeks she, and over a million other students, will find out just how well she did. Note: DadKnowsBetter received no compensation of any kind related to this post. The opinions expressed here are my own. I couldn’t agree with you more. Back in those “dinosaur times” when I was in high school (about the same time as you apparently) I remember this test being offered once. Now that my oldest is in college I’ve noticed there is a whole cottage industry around getting your child ready for college with test prep and life skills and organization and whatever. It’s crazy. I’ve also noticed over the years the importance of a high school diploma has diminished. If you don’t have “some college” on your application, you may as well just have your GED.